Today, I am delighted to share a blog post with you written by our guest, Jennifer Watson. But before I share the post, I need to share a story. It’s wonderful how God brings people together to encourage each other on their faith walk with Him. One of those people in my life is Jennifer Watson. We connected about four years ago through her Broken Girl website. After I submitted a few encouraging comments about the posts written by Jennifer and Keri Lynn Bullington (with whom Jennifer co-founded the Broken Girl blog), Jennifer invited me to share my "broken girl story" on her blog. After thinking about it for like a minute, I agreed to share my story because I believe there are people in the world who may be encouraged in their life journey through reading my story about how God turned my broken into beautiful. So I wrote the guest post, sent it to Jennifer and it was published on Feb. 27, 2012. But our connection did not end with that one guest post, it continued in the form of an encouragement ministry. If I need prayer, I know I can talk to Jennifer who will not only pray but offer words of encouragement that help me in my journey through life. I value the prayer support and encouragement given through the words Jennifer shares with me and the world via the Broken Girl blog which I call a ministry. I hope you will appreciate and receive encouragement in your journey through life as you read the words from Jennifer’s heart presented in her first guest post for my blog! Almost two years ago we welcomed a little boy into our home for four months, we were in the process of adopting him when his mother decided she wanted him back. Those four months were extremely difficult. I wanted the boy, just not all the strings attached and baggage that came from his family fighting us. But love is about welcoming the chaos and opening your heart wide enough for it to break wide-open changing you forever. I watched love change my heart as I loved a stranger like he was flesh and blood, no different from my children. I was never one to fall in love so easily, but sometimes love is like driving a car fast without any brakes. You brace yourself and hold your breath uncertain of the outcome. What once was invigorating and exciting hits the brick wall of change and you emerge different. The hope is that eventually the whiplash will fade to nothingness and your heart will be mended yet remain wide-open. Love is letting go of your fears of loving someone you might not get to keep and loving so much it hurts in the best possible way. Love wrecks you turning you inside out, it's the furthest thing from selfish and the closest thing to sacred we could ever feel. It's messy and beautiful and worth it. The messy beautiful walk hand-in-hand and sometimes it hurts in ways words can’t express. People always ask me if I would open my home again and I say yes, a million times, yes. I'll leave the light on for you, little buddy. I'll take your baggage and all your stains because fear doesn't live here, love does. And I'll leave my heart wide-open for my sister who feels like her world and heart has been split wide-open. Come and sit on my couch, you can cry and I'll feed you chocolate. Together we can unpack your baggage, mending the tattered garments of your heart. In our churches, in our homes, and in our hearts let us leave room for all the broken, baggage carriers because at one time that was us. Let’s love each other enough and help them unpack their baggage. We will never regret loving fiercely and allowing our hearts to split wide-open. Love isn't about counting the costs and being careful; it's about saying it's worth it. Come on, love, wreck me. Loving the way Jesus does is risky, but with all my heart I believe it’s worth it. Jesus walked this earth with every intention of laying down His life for us, even for the ones who rejected and mocked Him. Laying it all down and living a life of putting others first is risky, but I want to love like that. My heart is full of gratitude for a cross, an empty tomb, and a risky, unending love. There is room enough in my heart to be wrecked, split wide-open for those in need around me and I want more than anything to stop being so dang careful. 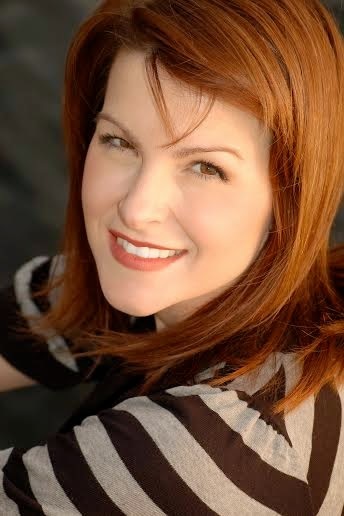 Author bio: Jennifer Watson is a self-professed girly-girl who is convinced that coloring your hair is addictive. She has an undying affection for refined sugar and red lipstick. She is a mother of two miracle babies and is an out-of-the-box minister’s wife. She loves weaving words together to speak to the hearts of women. You can hang out with Jennifer and her words at the Broken Girl blog. What to Tell Yourself When You're Under Pressure from Elevation Media on Vimeo. Where to Look When You Feel Unloved from Elevation Media on Vimeo. Did you know YOU are a DIAMOND? Elevation Creative: Diamonds from Elevation Media on Vimeo. This post is part of the Fly a Little Higher (book) blog tour which I am delighted to be a part of along with hundreds of bloggers raising awareness and giving hope to those with cancer. To learn more and join us, click here and grab a copy of the book here. 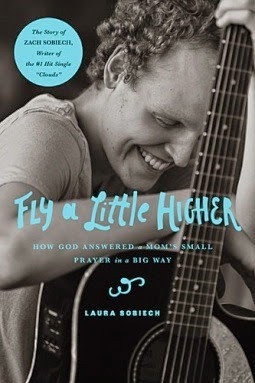 Fly a Little Higher is a book written by Laura Sobiech who is the mother of Zach Sobiech. Laura spent the last three years walking alongside her teenage son Zach throughout his journey with cancer and blogging about their battle with the disease. The song “Clouds” was Zach’s farewell to family and friends and it hit #1 on iTunes the same week he passed away in May 2013. Holly Furtick, wife of Steven Furtick who is the lead pastor of Elevation Church in North Carolina, preached a sermon on discouragement—how to recognize it as an attack from the enemy and how to overcome it. Essentially, Holly said when you feel discouraged, don’t isolate yourself—get around people. It is important to reach out to others and make effort to be in social situations such as volunteering for a cause close to your heart because participation in community can help heal the human heart. There was a time in my life when I felt I could not get around people to ease my discouragement because people would not understand what I’d experienced nor be able to help me with what I went through. But in those dark moments, I learned about someone who could help me in a way no human can. His name is Jesus Christ. It was through the traumatic time in my life that I learned more about who Jesus is…a Comforter, a Savior, and the Truest Friend I’ll ever have in this journey called life. Growing up, I was surrounded with people who knew Jesus Christ as their Lord and Savior. My ears constantly heard stories about how God was working in the lives of those around me. But I didn’t come to know Jesus Christ on a deep and personal level until going through the dark time where He was the only one who understood me and was there for me when no one else could be present. The dark time for me was having a nervous breakdown at the age of 16. I had to be hospitalized for about a week or two (the exact dates I do not remember). A lot of issues were going on at the time, issues that made me feel completely alone and isolated. After being diagnosed the doctors prescribed me a medicine that I’m supposed to take for the rest of my life as long as I’m battling this illness. The medicine helped me manage my illness but it also created a deep, ravenous hunger within me and for the first few months of returning home from the hospital, I ate like there was no tomorrow. I craved carbs. I craved sugar and anytime I had access to those items, I ate like eating was going out of style. But even with the constant eating, I was not satisfied because the hunger felt endless. The major affect from the medicine is weight gain and my size ballooned—I gained more than 100 pounds in less than six months and it’s been difficult to lose the weight ever since. Clearly, going from a size six to double-digit clothing and shopping at plus size stores like Ashley Stewart and Lane Bryant did a number on my self-esteem. And as for dating? I knew no guy was going to ask me out looking the way I did so I didn’t even act interested. My depression from the side effects of the medicine caused me to withdraw from social situations and walk around in a metaphorical bubble. I figured that if I didn’t let anyone get close to me, I couldn’t be hurt. I knew that if I acted like the stares and whispers about my new bloated figure didn’t bother me and if I used humor and laughed a lot then most people would consider me simply as another fat and happy person when inwardly the opposite was true. Sometimes my mom and I have conversations about my illness, the medicine and my experience. During those conversations, sometimes the question arises about “why” God allowed this to happen to me. The question often isn’t entertained because God is Sovereign and He knows what He’s doing however one day, the answer sprang up from the depths of my soul. “Because He (God) wanted to birth a ministry,” I said. The words just flowed up from my heart into my throat and out of my mouth. Instantly, I knew God was speaking through me and realized that those words are completely true. It was a revelation for me because I finally realized that the dark time I went through was purposed to help me grow close to the heart of God and inspire others to know Him as their Lord and Savior. Near to the heart of God is the place where I learned of His endless love, healing compassion, grace and mercy for not just me but ALL of His children. Since that time, I endeavor to tell the whole world about the goodness of God and the Gospel of Jesus Christ. It’s a message of HOPE, FAITH, LOVE and proves that at the heart of Christianity is an altar call. A call from the heart of God asking you gently to come to know Him for yourself and to come just as you are. God will not judge your looks because He sees your heart and knows exactly who you are and what you need. I believe a need for Jesus Christ is nestled deep inside each of our hearts and only He can satisfy our hunger for Him. In closing, I’d like to share with you the story of Zach Sobiech. I believe His life was a blessing to all he encountered and his death was the beginning of something powerful—God using Zach's story as one of His ways to encourage, uplift and save lives. But it doesn't stop there, it continues in the life stories of every person who reads Laura Sobiech's book, Fly a Little Higher or listens to Zach’s song, “Clouds” on iTunes. I encourage you to buy the book and write a review telling the world how reading about such a selfless and brave soul (Zach) encouraged you in your life’s journey.